By the time she finished writing her first suicide note, Gianna knew everything she was telling her mother would be better said in person. She could only have that conversation if she was still alive, and that thought, she said, pulled her back from the edge. “It was really morbid for me as a kid to [write] it, but it actually calmed me down,” Gianna said. She wrote the second note without any intention of actually harming herself. It was more of a coping mechanism to deal with the crushing pressure of school and the expectations she says are heaped onto many Silicon Valley teens, she said. That’s when she wrote the third letter. She told her parents it wasn’t their fault. She told her older sister she was sorry she wouldn’t be there to support her. Then Gianna said she tried to take her own life. She was just 14 years old, still a freshman at Cupertino High School. Now, two years later, Gianna says she’s doing much better, sharing her story to shed light on the mental health crisis affecting thousands of students statewide. Nationally, the suicide rate is up 31 percent for teenage boys and more than 50 percent for teenage girls since 2007. It’s the second leading cause of death among adolescents, and in 2013, the last year for which state data is available, at least 31 Bay Area teens committed suicide. An NBC Bay Area investigation found hundreds of Bay Area high school students were placed on involuntary 72-hour “5150” mental health holds during the 2016-2017 school year. The investigation also found that most school districts, including some of the largest in the state, are in the dark about this data, which could help them address student safety. The 5150 code is used to identify people at risk of harming themselves or someone else. Police officers and qualified clinicians have the authority to place a student on a 5150 hold, which means they’ll be sent to a psychiatric hospital for evaluation and monitoring. NBC Bay Area surveyed 28 of the largest school districts in the Bay Area and across the state and found only eight of those districts are actually keeping track of how many of their students are being placed on a 5150 hold. Across those eight districts, students were placed on a 5150 hold at least 455 times last school year. The Oakland Unified School District, one of the largest in the state, had students placed on involuntary mental health holds 117 times last year. And those numbers often do not include 5150 incidents that occur off campus. Major school districts, such as San Jose, San Francisco and Palo Alto, are among those that don’t track this data. Palo Alto Unified School District has struggled through two separate suicide clusters since 2009. At least nine students took their lives. The Centers for Disease Control and Prevention focused a study on this at-risk community last year and found the city’s suicide rate is nearly three times the state average. NBC Bay Area made numerous interview requests to speak with former Superintendent Max McGee and Interim Superintendent Karen Hendricks, as well as Palo Alto Unified school board members over the past several months. In September, school board President Terry Godfrey said he preferred “not to speak about the topic” because of a recent student suicide. But just outside the Bay Area, a school district that suffered a recent suicide cluster of its own has begun tracking 5150 data as a way to help prevent future tragedies. The district grappled with the suicides of four students in the span of the 2016-2017 school year. 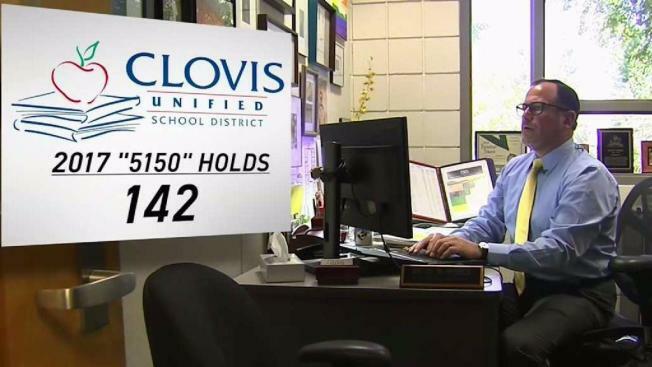 “It traumatized the community,” said David Weber, the lead psychologist and a crisis intervention counselor at Clovis Unified School District. He said the deaths spurred the district to aggressively assess how it was handling student mental health issues, and tracking 5150 holds was a way to help the district understand the scope of the issue, as well as how to help students return to campus with support. “If that student is placed on a 5150 hold and then that student ends up coming back to a school setting and the school never knew, that student is not receiving any support for this traumatic experience,” Weber said. Weber said he thinks it’s a policy all schools should adopt. Weber said the district has its own police department that interfaces with school administrators and counselors when a student is placed on a 5150 hold stemming from an on-campus incident. But the district is also partnering with local hospitals in an effort to learn when they occur off campus. Weber said the local hospitals are now encouraging parents to inform the school when their child is put on a 5150 hold so the school can be prepared to appropriately reintegrate that student when they come back. He also said talking about suicide and mental health issues is critical. Gianna’s district, the Fremont Union High School District, does not currently track 5150 data, but it says that will soon be changing. After NBC Bay Area reached out to ask the district why it does not record 5150 data, the district said it had been in discussions to do so and planned to begin soon. Gross said that, much like Gianna, the most common issues that students disclose to counselors are centered on anxiety and depression. Gross said students often mention stress as well. Like Clovis Unified, FUHSD is also partnering with health care facilities. As for Gianna, she’s now working with a program called Bring Change to Mind at her own school. It’s a nonprofit dedicated to raising awareness and reducing stigma about mental health. She even published her own article recently in the Huffington Post about her experience. “It’s mental health through the eyes of teenagers, through the people that are struggling through it,” she said. “As much as people don’t want to admit, times are changing very fast. The experiences kids are facing now are definitely different from what they faced a couple of years ago. It’s wonderful to hear from an adult, but to me as a kid, it’s even better to hear from someone my age because I feel like they’re more in touch with society as it is now. They’re more in touch with what I’m feeling." If you or anyone you know is in crisis, someone is available to talk and listen 24-hours a day. The suicide prevention hotline is 1-800-273-8255. By the time she finished her first suicide note, Gianna knew all the things she was writing to her mother would be better said in person. She could only have that conversation if she was still alive, and that thought, she said, pulled her back from the edge. She decided not to follow through. That’s when she wrote the third letter. She told her parents it wasn’t their fault. She told her older sister she was sorry she wouldn’t be there to support her. Then Gianna swallowed a handful of over the counter pain pills. She was just 14 years old, still a freshman at at Cupertino High School. An NBC Bay Area investigation found hundreds of Bay Area high school students were placed on involuntary 72-hour “5150” mental health holds during the 2016-2017 school year. The investigation also found that most school districts, including the largest in the state, are in the dark about this data, which could help them address student safety. “5150” is the code used to identify people at risk of harming themselves or someone else. Police officers and qualified clinicians have the authority to place a student on a “5150” hold, which means they’ll be sent to a psychiatric hospital for evaluation and monitoring. NBC Bay Area surveyed 28 of the largest school districts in the Bay Area and across the state, and found only eight of those districts are actually keeping track of how many of their students are being placed on a “5150” hold. Across those eight districts, students were placed on a “5150” hold at least 455 times last school year. The Oakland Unified School District, one of the largest in the state, had students placed on involuntary mental health holds 117 times last year. And those numbers often do not include 5150 incidents that occur off campus. Major school districts, such as San Jose, San Francisco, and Palo Alto are among those that don’t track this data. Palo Alto Unified School District has struggled through two separate suicide clusters since 2009. At least nine students took their lives. The Centers for Disease Control and Prevention focused a study on this at-risk community last year and foundthe city’s suicide rate is nearly three times the state average. The district eventually stopped returning calls and emails until this month when NBC Bay Area visited the district office to film. School board member Todd Collins emailed to ask about the report and said “I think they are reluctant to talk about 5150s for various reasons,” but said he would ask the superintendent to reach out to NBC Bay Area directly to discuss. As of press time, Hendricks has not responded. But just outside the Bay Area, a school district that suffered a recent suicide cluster of its own has begun tracking “5150” data as a way to help prevent future tragedies. The district grappled with the suicides of four students in the span of the 2016-2017 school year. He said the deaths spurred the district to aggressively assess how it was handling student mental health issues, and tracking “5150” holds was a way to help the district understand the scope of the issue, as well as how to help students return to campus with support. Weber said he thinks it’s a policy all schools should adapt. Weber said the district has its own police department that interfaces with school administrators and counselors when a student is placed on a “5150” hold stemming from an on-campus incident. But the district is also partnering with local hospitals in an effort to learn when they occur off campus. Weber said the local hospitals are now encouraging parents to inform the school when their child is put on a “5150” hold so the school can be prepared to appropriately reintegrate that student when they come back. Gianna’s district, the Fremont Union High School District, does not currently track 5150 data, but that will soon be changing. After NBC Bay Area reached out to ask the district why it does not record 5150 data, the district said it had been in discussions to do so, and planned to begin soon. Gross said that, much like Gianna, the most common issues that students disclose to counselors are centered on anxiety and depression. Gross said students often mention stress, as well. Like Clovis Unified, FUHSD is also partnering with healthcare facilities. As for Gianna, she’s now working with a program called “Bring Change to Mind” at her own school. It’s a non-profit dedicated to raising awareness and reducing stigma about mental health. She even published her own article recently in the Huffington Post (Link) about her experience. “It’s mental health through the eyes of teenagers, through the people that are struggling through it,” she said. “As much as people don’t want to admit, times are changing very fast. The experiences kids are facing now are definitely different from what they faced a couple of years ago. It’s wonderful to hear from an adult, but to me as a kid, it’s even better to hear from someone my age because I feel like they’re more in touch with society as it is now. They’re more in touch with what I’m feeling.